Sunday mornings Chez Toulouse are an occasion worth looking forward to - we grocery shop at our local farmer's Aldi, then come home and clean the apartment to our favorite Judy Garland and Fleetwood Mac records. It's the Lord's day and I intend to do whatever the hell I want with it. Neighbors bedamned! Gin rickeys, holistic toilet bowl cleaner and The Man that Got Away sound like a Sunday-Funday to me. While I scoop the litterbox and work on my vibrato, a homemade marinara sauce usually simmers away on the stove. My hot Italian blood is only good for two things: exaggerated emotional outbursts and one helluva pasta sauce. I don't believe in jarred sauce, but I do believe in spending just as much and working twice as hard on sauce that basically tastes the same. In my poorer years, I lived on pasta and Ragu. Now that I'm a grown man with love handles, I try to consolidate my carb-intake to one night of the week. This ever-romantic weekend tradition is known as Pasta Sunday at my house. When all my chores are done, my plus-one and I slip into our best elastic-waisted bottoms and plop our fatasses down in front of a movie I rented from the lib'ary. That's amore! I must like a challenge, because somehow I ended up with a vegetarian. As a Midwesterner, I've been raised to believe that it's not dinner unless a dead animal is somewhere on the table. I've not yet converted to vegetarianism, but I have to accommodate dietary restrictions (real or imaginary) when I want to recreate scenes from Lady and the Tramp. 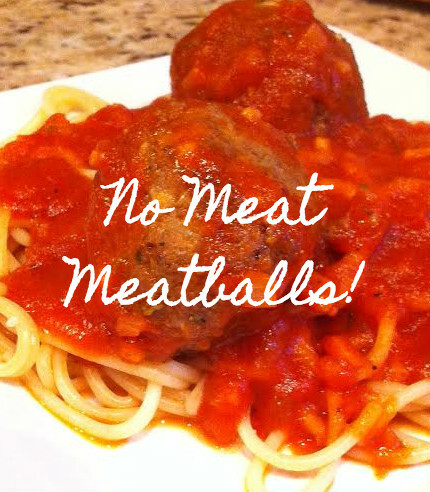 I've never made meat-less meatballs and I didn't look at a recipe before I got started. As stated above, Italians are prone to bouts of irrational anger, and this culinary experiment proved no exception. I assumed I could just use the fake meat as I would ground beef, and I was pretty much right. 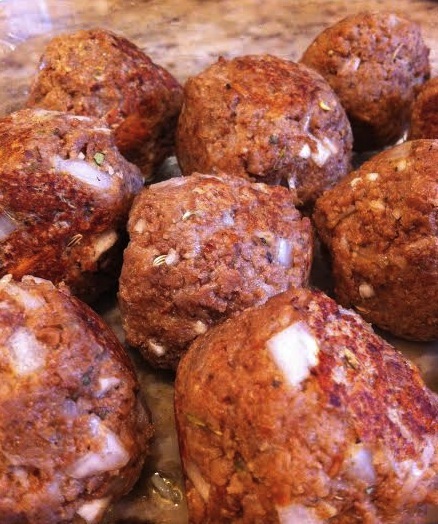 Many strings of expletives and a slew of binding agents later, we had vegetarian meatballs. Step 1: Set oven to 350. Soak bread in milk until very soggy. Add other ingredients and mix with jazz hands. Add more breadcrumbs to thicken if needed. Salt and pepper to taste. Step 2: Heat some oil in a skillet. Brown all sides of your balls to form a skin. 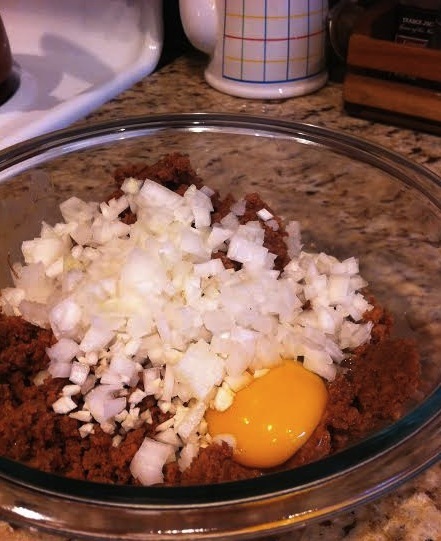 If they fall apart you've done it wrong and they need to be thickened with more breadcrumbs. "*%&$&%!!!!!!!" 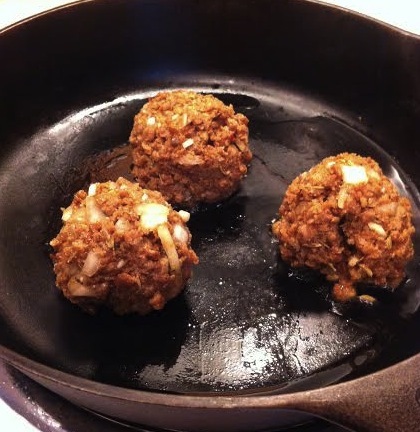 Step 3: Set browned balls in a baking dish coated with a small amount of oil. Cover with foil and bake 40 minutes. 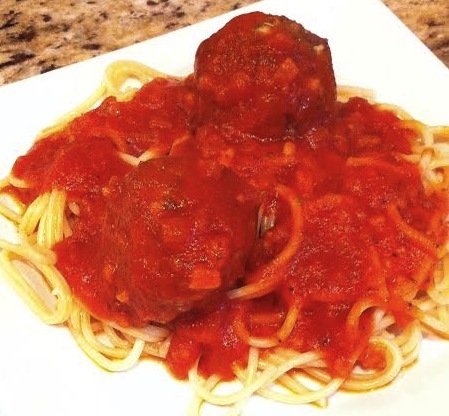 Serve with the house marinara, salad and unlimited breadsticks.